I am not a member of the Christian Association of Nigeria (CAN), but I was not happy when the tenure of Archbishop John Onaiyekan as president of CAN ended and heralded the commencement of that of Pastor Ayo Oritsejafor, president of the Pentecostal Federation of Nigeria. Archbishop Onaiyekan has been a bridge builder and a pillar of Christian-Muslim dialogue in Nigeria before, during and after occupying the exalted position of the CAN presidency. No Christian-Muslim committee for mutual understanding is complete without the name of John Onaiyekan. He has a genuine passion for and a total commitment to Christian-Muslim peaceful co-existence and mutual respect. Genuine, because when you come close to him, you can easily discern that conflicts and lack of harmony between the adherents of Islam and Christianity hurt him; he sincerely wants us to live in peace. Every year I and many Muslim scholars and leaders in Nigeria receive at least 4 congratulatory and goodwill messages from Archbishop Onaiyekan: 1) for the Maulid celebrations; 2) another on commencement of the fasting of the holy month of Ramadan; 3) the one for the Sallah (Lesser Bairam) festivities marking the end of fasting season; and 4) in form of a personalised seasonal greeting cards (Greater Bairam hajj sallah celebrations) addressed to the Muslim recipient from the Holy Sea, Vatican and signed by His Holiness, the Hope. This is the peak of investment in Christian-Muslim mutual understanding! In his public utterances Archbishop Onaiyekan does not waver in speaking the truth to power, for the words he speaks come from his heart with clear conscience, seeking acceptance only from his Maker and not desiring public acclaim or governmental largesse. No; he always prefers Christians and Muslims coming together on their own, not at the government’s behest, to form bodies for the purposes of dialogue and harmonious relations. 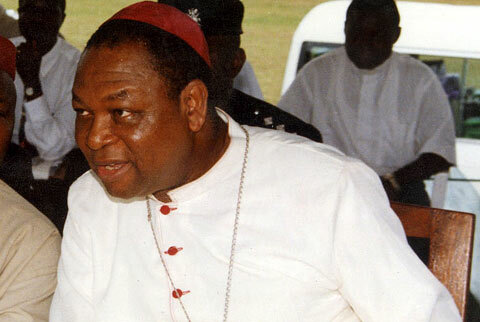 Humble yet elegant in his simple, ascetic and clerical tunic, Archbishop Onaiyekan is a shining example of how a CAN president should exercise restraint in times of crisis, use his offices and public pronouncements in extinguishing the embers of religious hatred, senseless killings and burning of places of worship. 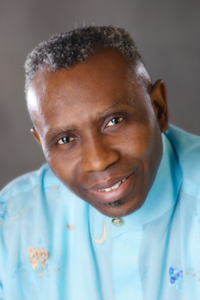 Pastor Ayo Oritsejafor is a distressful successor to Archbishop John Onaiyekan. His past record during crisis periods even before ascending the throne as CAN president has been fraught with reckless and inciting statements. Old habits die hard; last Sunday, the fiery pastor called for the immediate arrest and prosecution of General Muhammadu Buhari and political leaders in the North for inciting post-election violence in the Northern part of the country. “I don’t know how the Federal Government should sanction sponsors of such mayhem that have left hundreds of innocent Nigerians dead” said Pastor Ayo, “but I think the government should do something to keep this nation one indivisible entity for the benefit of every citizen…. I believe in one indivisible Nigeria but I also believe that if Nigeria is ever going to remain one nation, which I believe it could, then certain persons must be sanctioned because of this continued violence we are experiencing in the northern part of Nigeria. What do you expect from a man of God who declared his support to candidate Goodluck Jonathan days prior to the elections? Do the above words resemble those of a clergy or will they most appropriately fit a card-carrying member of the PDP? I believe Archbishop Onaiyekan will not make such a vile accusation against Buhari or the Northern leadership knowing well that Buhari has not encouraged or supported violence against anybody. Rather, in line with his calling as a man of God and a leader, Archbishop Onaiyekan is sure to condemn the violence, as all of us are wont to do, advise the government to stop the carnage and tersely make reference to the causes and how to avoid recurrence. In a recent (6th April) Breakfast Meeting at Hilton Hotel, Abuja, between religious leaders and members of the International Observation Mission to Nigeria’s 2011 Presidential Elections under the aegis of National Democratic Institute (NDI), Archbishop Onaiyekan questioned the rationale of election observations if that will not be followed up with concrete action by the observers if elections were found to be flawed, as witnessed in the past. Of course the international observers had no answer. To my mind the body is here to serve a purpose as we see in other places around the world: go to a limited number of polling units on Election Day, collate incomplete information about the conduct of the elections and pronounce flawed verdict. They called us to this Hilton meeting only to make us call people to order, avoid violence and inform them to accept the results of the ballots before they were cast. When the NDI president, Mr Kenneth Wollack asked us what role we were going to play in preaching to our flock to accept the election results, Archbishop Onaiyekan answered by saying: “I will not tell my people to accept flawed election results. In fact, where elections are rigged, I will encourage them to complain……………” This is what we expect from a CAN president; standing firmly for fair play and justice. Unfortunately, Pastor Ayo had no time for such important a meeting that was aimed at the role of religious leaders in curbing electoral violence. The CAN president was represented by Barrister Uko Albert, National Legal Advisor of CAN. What a pity! In his call for the arrest and prosecution of General Buhari, Pastor Ayo is depicting a picture of a Northern Muslim affair as if Pastor Bakare, Tony Momoh, Lanre Tejuoso and many other Christian members of the CPC are Muslims. Yes, some people voted on religious lines, but we must concede that both Muslims and Christians voted for all the candidates. Jonathan and Sambo profess different religions, just as Buhari and Bakare; in all cases, the one a Christian, the other a Muslim. The CAN president would have served a better purpose, as a man of God, by condemning the barbaric act of killing innocent souls on both sides, including those of the NYSC members, burning of churches and mosques, and the culture of rigging elections and stealing, changing results at collation centres which actually caused the unfortunate mayhem in the North. Incidentally, at least three of the corps members in Bauchi who lost their lives were alleged to have been colluding with election riggers and one was said to have been caught with fake electoral materials; this does not justify the killings, that is barbarism in its crudest form, but it tells you that when people are pushed to the wall and expect no real justice, they do take the law into their own hands. That “one indivisible entity…” Pastor Ayo claims to believe in encompasses Christians and Muslims, Northerners and Southerners; we are all intertwined with and in each other by religion, lineage, matrimony and geography. So, when religious leaders speak on sensitive issues they should choose their words carefully to avoid rubbing salt into open wounds and injuring the sensibilities of others many of whom may be members of their flock. Introducing those he called ‘gullible illiterates’ to the issue of zoning was an ungodly combination. The two are not related. Only a person who descends from Mars will claim ignorance of PDP’s zoning formula that was jettisoned after its earlier ratification by some strong members that included Pastor Ayo’s benefactor. The ‘gullible illiterates’ are reacting, albeit in a wrong way, because the results declared from the collation centres were tampered with, did not reflect what occurred in their various polling units the outcome of which they knew. Their reactions were unconnected with the victory of the PDP elsewhere. It was not due to anybody telling them when is “their turn to rule”. They only wanted a true reflection of the voting pattern! Even the INEC chairman acknowledged that there was an ‘honest’ mistake in the figures declared for the CPC in Kaduna and Kano by as much as 26% and 40% respectively! Only a manual calculation of the results exposed the fraud. The CPC, not Buhari alone, is alleging the same thing in other parts of the country. It is certainly curious to hear of 78% voter turnout in areas where originally, all reports said the turnout was lower than that of the National Assembly elections, which witnessed around 55% voter turnout on average. While no sane person should conclude all the allegations are true without seeing concrete evidence, no one who is sane should likewise dismiss them as frivolous. Pastor Ayo seems to be oblivious of the pervasiveness of ‘gullible illiterates’ in Nigeria, or is he? Every geo-political zone has more than its fair share of the menace of these gullible illiterates manipulated and used as thugs by the ruling elite; the only difference is that some have advocates in the highest offices in the land, in such a way that even where they detonate bombs, kill innocent Nigerians and claim responsibility for the act, their advocate-in-chief would offer presidential defence exonerating them of any wrong doing. George Orwell’s Animal Farm? No firebrand edict from the CAN president against these presidential incongruities. Another noticeable disparateness among the gullible illiterates is in the way governments at all levels implement workable programmes towards rehabilitation, education, poverty alleviation and job creation. Where those of Northern extraction have been neglected and often mown down by heavy artillery at times of crisis, those from the South-South, who have made and are still making life difficult for ordinary Nigerians, are now enjoying an amnesty programme, housed in rehabilitation centres with munificent monthly allowances, and many of them are now studying abroad under a government scholarship scheme – thanks to the intuitiveness and foresight of a President from the North! Upon hearing the news of their kinsman’s victory, the so-called reformed militants who have ‘surrendered’ their arms and ammunition found some from thin air and detonated bombs and fired countless rounds of live ammunition into the air in celebration. I wrote I WILL NOT VOTE FOR HIM and a reader retorted that I was not God; the man was ‘God-sent’. The answer to this is that not voting for him would not make him lose the election; there have always been contingency plans against that, but it makes my conscience clear that I did the right thing. Come to think of it, we always get the kind of leaders we deserve. The next few years will prove me right or wrong. 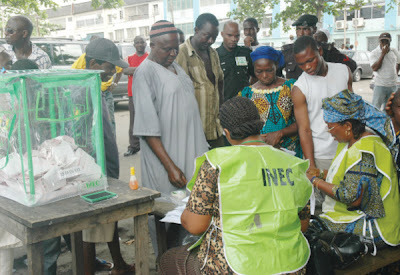 This ‘umblera’, as the Fedora’s consort is wont to call it, is decrepit and leaking profusely; those under its shade - some of them are good people but many of them are perverted election riggers – are oblivious of the strength of a wind of tsunami proportion gaining currency among the Nigerian electorate: change! The worst of shelters is that offered by a cobweb, the spider’s house; it does not cover the spider from wind or conceal its secret from onlookers; it neither protects from rain nor does it shield it against sun’s heat. If the spider, destined by its Maker to weave and use cobweb as dwelling, cannot contemplate change; the people under the umblera, as human beings endowed with the faculty of discernment, can and should have a U-turn to a better, more protective shade since the one under which they gather is not serving its purpose! Some of them had sought refuge in other territories in the past only to renege and return to the ruining party after securing victory under a different platform. Renegades in politics! It brings to mind Divine narratives in the holy books about people believing then, disbelieving and later believing, then disbelieving and again believing only to disbelieve a third time and so on. Is the same scenario repeating itself in the desertions (popularly called decamping in Nigerian English) we see from the umblera to the wining party? Whatever is the case, I will not vote for a political renegade who is in politics for his personal gains, on a narrow marge; when his party allows him to contest, he is well content; but if another is anointed, he turns on his face to another party to get elected, only to revert, as stated above, to the leaking umblera afterwards. I won’t vote for a man, who cannot even keep his words and honour his agreements; who signed an agreement on power rotation to keep the nation one only to renege and defend his greedy plans. Let them dominate the airwaves with their laughable adverts with contraband candidates; people can see beyond the curtain of plagiarised jingles and vote according to their conscience. Let them continue to dole out our commonwealth in crumbs and bits to hungry, unprincipled mercenaries; it will not matter much if Allah brings His victory. I will not vote for a clueless, incipient candidate who does not have the wit to proffer workable solution to our problems. One who is apparently out of touch with the economic realities of Nigeria; I will not vote for him. One whose only claim to greatness was that he appointed the indomitable and irrepressible arbiter of our votes; a decision he took when he was yet to decide on contesting. A leader who forbids people to rig for him but aids and abets rigging with his actions, who promises a free and fair election but whose agencies repress any attempt to have a level playing field; I will not vote for him! Leadership means ability to articulate vision; to explain it unequivocally in such a way that no one is left in doubt about the leader’s belief in the path he intends to tread, and thus he will effortlessly convince the led to be his companions on the journey to better standard of living, economic prosperity and security of life and property. The presidential debates present a unique opportunity for candidates to tell the electorate what they envisioned as key to more prosperous nationhood and unwind their plan on how to enrich our future. I will not vote for such candidate as deserts presidential debate venues unless they are stage-managed by government-controlled media; one who insists on seeing the questions beforehand. I am not looking for a Muslim or a Christian candidate for my vote. I’m looking for a group in which I can entrust my future and that of my progeny. When I voted for change during last Saturday’s elections somebody asked me who I voted for. I said I don’t know. What I know is that I did not vote for the umblera, so I didn’t need to know the candidate. That may be wrong politically under normal circumstances. But in a situation like ours where a clique has vowed to steal our mandate for sixty years running, what is important is voting the ruining part out of office by any means necessary. Nigeria can show the world that revolution is possible without marching to Tahrir Square! Professor Attahiru Jega’s INEC assures us that ballot papers have hidden codes according to polling stations. This will assuage fears and strengthen our faith in the current electoral process that at the end of the day, with all the fake ballot papers floating on the wave of umbleraic attempts to rig the elections; with all the snatching and stuffing of ballot boxes, our votes will, nevertheless, count, as we ardently hope that Jega’s INEC will expose the counterfeit votes in election tribunals and give evidence in support of the people’s will. As Fedora and his ‘nest of killers’, to quote Kongi himself, promise us fresh air, I say it is true; after all, what is their promise except empty air? - Fresh or stale! Events in Ivory Coast have shown the end of obstinate election riggers: disdainful capture, humiliated exit and the restoration of power to the rightful winners of elections! By the way, to answer the question of whom to vote for on Saturday, I say if you are satisfied with the way the Umblera people have administered the country in the last 12 years, please vote for Fedora; but if you suffer what millions suffer daily in this country because of inept and corrupt management of our human and material resources, please vote for change. I hope I am clear enough. Allahu Akbar! This is one of the best articles I have read in recent times. I so much enjoyed it that I read it thrice. I was somewhere recently and we were discussing it. We all concluded that Allah will use His ``Jalajalaluhu' on them. And for your information, my friend in New Nigeria wants to publish the article. Would you be kind enough to send him the picture electronically? The banner along airport road strategically placed adjacent to the City Gate cannot be missed by many. 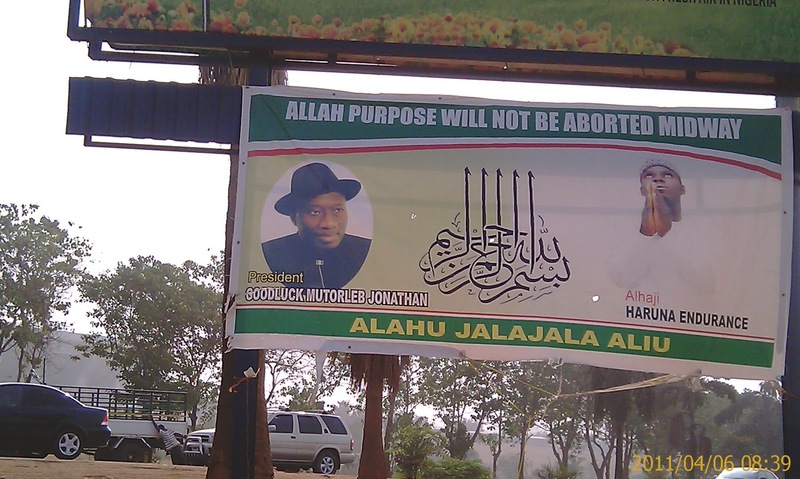 The said banner, captioned ALLAH PURPOSE WILL NOT BE ABORTED MIDWAY has, from left to right, the handsome picture of President Goodluck Mutorleb Jonathan, a beautiful Qur’anic calligraphy of Basmalah (opening verse for all surahs but one in the Glorious Qur’an) at the middle, and another picture of the sponsor, one Alhaji Haruna Endurance, with his two palms clasped together in a prayer fashion, his eyes raised to the heavens. At the base of the banner is this transliteration of Arabic text: ALAHU JALA JALA ALIU! Before I delve into textual criticism of the banner and its contents let me remind the reader that I’ve always encouraged religious harmony and mutual understanding on this column, in my radio/television programmes and other public engagements. I believe that God created Christians and Muslims to recognise their differences and respect one another’s ways of worship in the variant creeds they profess. Thus, it behoves us, as members of these two great religions, to honour the religious sensibilities of the other even where we do not share that belief. Nothing short of this shall ensure peaceful coexistence in a multi-religious nation like Nigeria. In line with the above averment, the majority of Christians believe, among others, in the Holy Trinity, the Cross as an emblem depicting the crucifixion, etc. Muslims believe in Jesus Christ (peace be upon him) as a great Messenger of God, born miraculously without a male’s intervention, and what not. We do not believe Jesus (peace be upon him) was God incarnate, son of God, was crucified or that he is part of a trinity. I will not blame a Christian for not sharing my belief in Jesus or harm him in any way because of his belief in the Trinity. He can remain what he is, believe what he likes, practise the dictates of his faith and still, with all these differences, he enjoys my respect, good neighbourliness and friendship. What is required of both of us is recognising the fact that in exercising our rights to practice the precepts of our faith, we should not hinder or infringe on the rights of others in practising theirs; understanding our differences in belief and the avoidance of hurting each other’s religious feelings. Now, I will take strong exception to a Christian, for instance, who, in an attempt to garner support for Vice President Namadi Sambo among Christian electorate, would use his picture with a cross or a biblical verse which the Vice President, being a Muslim, does not believe in. It would be an aberration! Similarly, President Goodluck, as a Christian, does not believe in the Basmalah the meaning of which is: In the Name of Allah, the Most Gracious, the Most Merciful; a direct opposite of: In the Mighty Name of Jesus, or In the Name of The Father, and of The Son, and of The Holy Spirit! What was Alhaji Haruna Endurance trying to underscore by printing the Qur’anic calligraphy of the Basmalah on the banner? What type of Muslim is Alhaji Haruna? Or will it be that this Mr Endurance is not a Muslim? Clasping of two palms in prayer is another difference in the modus oparandi of rituals in Islam and Christianity. A Muslim should open his palms when praying. The Prophet has been severally reported to have raised his hands up with his palms wide open that the curve of his armpit was visible in certain prayers that he offered. The prayer from the Holy Harams of Makkah and Madeenah are beamed live to the comfort of our dwellings. The Imams are clearly seen raising and opening their two palms during al-Qunuut supplications. So, why is our banner sponsor (if indeed he sponsored it) clasping his palms and praying? President Goodluck has been severally called by myriad names including Ebele and even Azikiwe; but Alhaji Haruna Endurance has chosen to christen Mr Jonathan with an Islamic appellation of Mutorleb! Only that this new name has further exposed the ignorance of the christener about the rules governing names is Islam. Mutorleb is a mutilated version of Muttalib which is a prominent name in the genealogy of the Messenger of Allah, Muhammad, (peace and blessings of Allah be upon him). Throughout the history of Islam the name has never been written without the prefix Abdul; hence Abdulmuttalib should have been the right form of the name. I still cannot understand why Alhaji Haruna, of all the fathomless names in Islam, decides to honour President Goodluck Jonathan with the name of one of the fathers of the Holy Prophet of Islam, Muhammad (peace and blessings of Allah be upon him)? The story is told of a gorilla and his master. The master wanted to take a nap so he told the gorilla to keep guard and not to allow anybody or anything, even if it be a fly, to disturb his sleep. Thereafter, the master reclined on his back, sleeping. Suddenly, a fly started buzzing and hovering around the master’s head; then it settled on his nose. Now, the gorilla, furious about this alien disturbing his benefactor’s sleep, stood up, got a heavy rock and hurled it ferociously on the fly that was resting on his nose, and in the process killed his master that he was to protect. A madman, it is said, is someone ‘reasoning correctly from erroneous premises’. The transliteration: ALAHU JALA JALA ALIU at the base of the banner brought to the fore the extent of ignorance of Mr Endurance. ALAHU JALA JALA ALIU is maiming of the correct form of ALLAAHU JALLA JALAA LUHU extolling the greatness of Allah’s Majesty. Apparently, Mr Endurance, due to lack of knowledge in the Arabic language, took the Basmalah for the Jalala, majesty and thus helped the English reader with a transliteration of his jumbled and flawed assumption. So, Basmalah that reads Bismillaahir Rahmaanir Raheem ended with a transliteration of Allaahu Jalla Jalaa luhu, if we avoid repeating the grave mistakes inherent in Mr Endurance’s ignorant transliterations. By God’s Providence, Goodluck Jonathan is the President, Commander in Chief, Federal Republic of Nigeria, whether one agrees or disagrees; this is the reality today which would not be altered by anybody’s acceptance or aversion. Alhaji Haruna Endurance, as stated above, captioned his banner with ALLAH PURPOSE WILL NOT BE ABORTED MIDWAY, let us leave the gruesome ‘murder’ of the English language in that caption for now. The Arabs believe that insanity has departments one of which is that of discordant grammatical expressions; Alhaji Haruna, given the contents of his banner, is sure to be a member of this group. This grammatically incongruent phrase will not merit any exertion on my part to correct it. I’ll leave as it is, but ask what is this abortion that Alhaji Haruna dreads concerning our dear President? If by will not be aborted midway Alhaji Haruna refers to any harm befalling the President before the end of his term on May 29th, 2011, I join him in saying God forbid! Allah will protect His Excellency from any calamity that alarmists like Alhaji Haruna may conjure in their mentally deranged psyche. But if on the other hand Mr Endurance desires a sort of Tazarce, continuity for Mr Jonathan as President to 2015, then, I say: that depends on the outcome of the 2011 presidential elections. It is not for charlatans to prophesy or malign the democratic process as an abortion in case the majority of Nigerians decide to vote President Jonathan out of office in a free and fair election. What sound minds do is to advise politicians to convince the electorate with cogent programmes and workable manifestos then pray for divine blessing, because God is not a member of the PDP or any political party for that matter! Alhaji Haruna has naught to stand upon politically, linguistically and Islamically. He has only succeeded in making a very big fool of himself, using religion as a bait to gain cheap publicity, recognition and patronage of the government of the day. It is said that it is better to remain silent and be considered a fool than to open your mouth and remove all doubt.